It’s rough being a meteorologist in Minnesota. Granted, no meteorologist anywhere in the world has a 100% track record of predicting what the weather is going to do. There is simply too much data extrapolation, probability, and just plain guesswork involved to ever be consistently accurate over a long period of time, at least with our current technology. Still, I think it’s safe to say that most people (meteorologists included) were surprised when the temperature in Mankato on Monday 9/20 reached a high point of 90 degrees Fahrenheit, at 11:30p.m.! Apparently a warm front shot up from the southern states and injected southern Minnesota with a booster of hot air, possibly due in part to a stray current originating from one of the several tropical depressions in the Gulf of Mexico. The even bigger surprise however came in the form of a deluge of rainfall throughout the southern half of the state, beginning Wednesday afternoon 9/22 and continuing through most of yesterday. It wasn’t until Monday or Tuesday this week that forecast models began to show the potential for extreme amounts of rainfall in a relatively short time, and even as of Wednesday morning here in St. Peter the sky was mostly clear and there was no obvious sign of the approaching storms. But around 3:00p.m. Wednesday the heavy showers began, and continued without cease for most of the next 27 hours. Reports from many areas in south-central and southeast Minnesota describe record amounts of rainfall for this time of year, exceeding historical amounts by several inches in some locations. The town of Amboy (south of Mankato in southern Blue Earth County) received the largest amount of rain, recording somewhere around 10.5 inches. In the town of St. James, which is about an hour southwest of St. Peter, an apartment had to be evacuated due to flooding. About an hour east of St. Peter in Owatonna, the Straight River exceeded its banks, prompting locals to sandbag in certain parts of town. Here in the Linnaeus Arboretum, our rain gauge recorded 4.46 inches of rainfall, which is the largest amount of rainfall in a 24-hour-or-so period in St. Peter in fifteen years according to some local experts. Today we have a reprieve from the rain (but not the wind); however, it looks like tomorrow we’ve got a good chance of more precipitation. This is bad news for towns already dealing with flooding, and who knows how much more water the Minnesota River will hold before it violently rises above its banks (and the river was already showing minor flooding in many areas due to the past weeks’ rainfall before this Wednesday). The good news is that after tomorrow, next week’s forecast predicts sunny, dry weather through the following weekend, with high temperatures hovering between the 60’s and 70’s. Take that prediction with as much confidence as you wish. 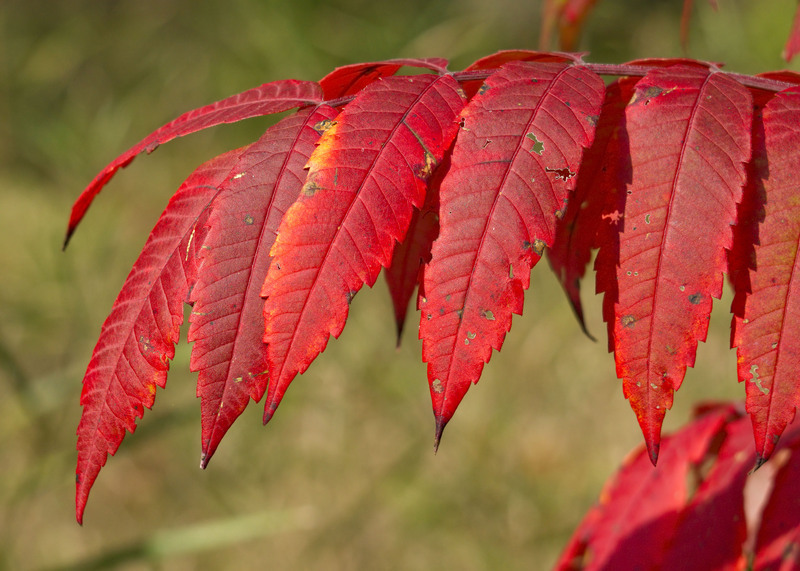 Staghorn Sumac showing peak fall color in deciduous woods north of Borgeson Cabin, 9/22/10.